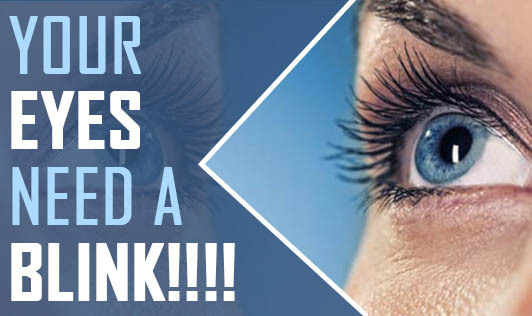 Your Eyes Need a Blink!!!! My recent visit to ophthalmologist made me realize that how important it is to give your eye a good care. There has been a tremendous increase in the ophthalmological problems faced by many of us, due to increased usage of computers. Excessive strain on eyes can lead to headaches, itchy or burning eyes, blurred or double vision. • Keep your screen clean. • Relaxation of your eyes is an important part of eye care. Rub your palms again each other until they are warm and place them on your eyes. The warmth from your palms can ease your eyes. • Don't work on a computer for long hours at a stretch. Take short breaks in between. • Eat foods that have Vitamin A, C, and E on a regular basis, it is proven to be very good for eye health. Foods that contain these vitamins include: carrots, green leafy vegetables, spinach, citrus fruits, fish, etc. • Wear the right type of contact lenses or your glasses if you face a problem with eye sight. • During breaks, splash water on your face, this gives an overall relaxing effect on the eyes. • Fit an anti-glare filter in case you have an old model of computer. You can also replace it with a new monitor to benefit from minimal glare, distortion and reflection. • Drinking plenty of water helps to reduce puffiness around your eyes. • Visit your ophthalmologist once every six months or earlier if there is a problem with your eyes. Blink your eyes often! This helps in keeping your eyes moisturized. These eye care tips can help you prevent eye fatigue and keep your eyes away from stress.